When Bento 2 debuted last fall, the enhancements to FileMaker’s personal database application included the ability to import and export templates. What’s more, FileMaker promised that it would create a place where users could share templates they had created in Bento. 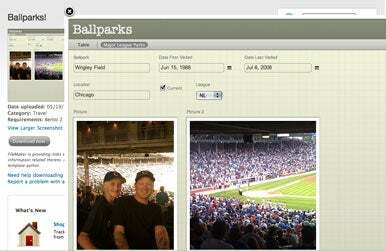 This database for tracking ballparks you’ve visited is just one of the Bento templates available for download at the newly launched Bento Template Exchange. The Web site features templates—pre-designed database forms lacking only data—in 15 categories: Arts and Photography; Business; Contacts and People; Cooking, Food, and Wine; Education; Events Planning and Projects, Finance; Health and Fitness; Home and Hobbies; Internet and Passwords; Music and Movies; Research and Notes; Sports; Time Management; and Travel. Visitors can also search among the most popular templates as well as recently added offerings. Templates downloaded from the Web site not only can be used with the desktop version of Bento; you can also put them to work with the recently released iPhone version of Bento after you’ve synced the mobile and desktop versions of the app. The idea behind the Template Exchange is that it gives Bento users a place to find ready-made documents for organizing information, tracking details, and storing data. Users who’ve whipped together their own Bento templates can also upload their handiwork to the Template Exchange, helping other users with similar organizational needs. Submitting a template is as simple as providing a name and description, choosing a category, and following the Template Exchange’s instructions. You’ll need Bento 2 to import and upload templates. But the service is available to users running the trial version of Bento as well as the full version of the personal database program.